Mambray Creek is part of the Mount Remarkable National Park, around 3 hour drive from Adelaide. 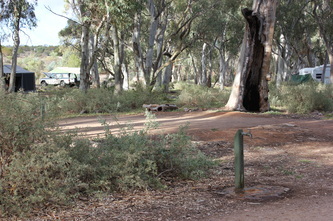 Located in the Park, Mambray Creek is the largest campsite with around 54 campsites. This National Park has a number of other camping options, but we have only stayed at the Mambray Creek campsite. Plenty of walks to keep everyone of different fitness levels occupied. We have received mixed reports of Mambray in recent times from other readers - these comments have ranged from it being great and well cared for, to other comments that lack of care and interest by rangers has made this spot less of a winner, with generators being used and people just driving in for the free showers and not paying fees. So as you can see, a camping spot will vary on times you visit and everyone's personal opinions. FYI : For campers who have generators. This is a NATIONAL PARK!!! You cannot use a generator here. To do so is against Park rules, plus very annoying for fellow campers who do the right thing, yet have to hear your generator going at all times of day and night. If you need to keep your fridge cold, then have an alternative power method when in a National Park. Well maintained flush toilets, cleaned regularly and including a disabled toilet. They have hot showers (solar but with gas back up), and also in excellent condition. There is a section to wash up dishes near the toilet block, though I have never succeeded in getting hot enough water at that tap. 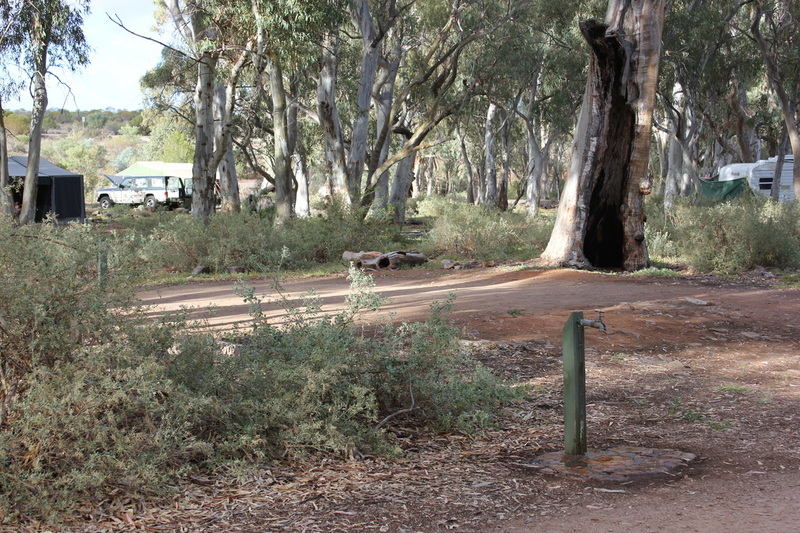 Taps are located near many campsites, with clean drinking water plus there are some water tanks (water not suitable for drinking). The proximity of these taps makes life a lot easier, and bringing in your own water is not an issue. This is such a plus when you are camping - not having to worry about water! If you have forgotten some key item or need ice, the nearest location is back towards Adelaide, around 20mins drive on Highway 1. If you are hiker, and want a quiet campsite, then you can hike into Kingfisher Flat. 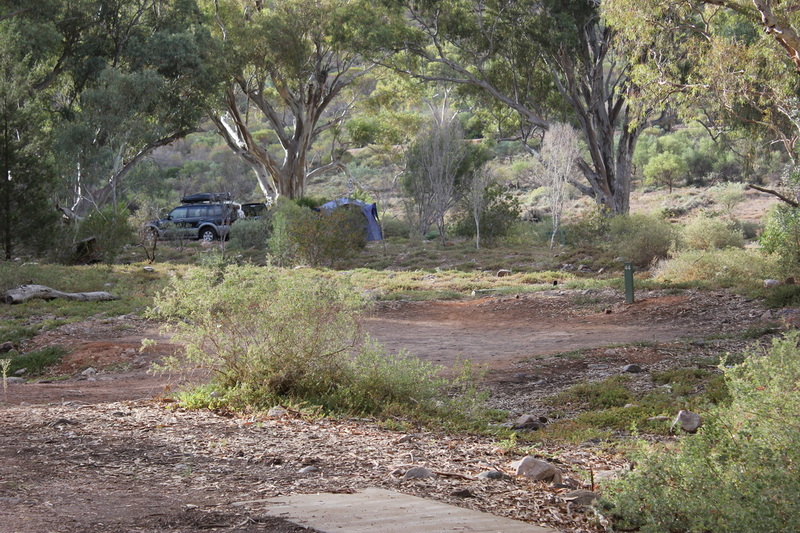 Read our review of Kingfisher Flat Camping here. Campfires are allowed out of fire danger season. You need to bring all your own wood. 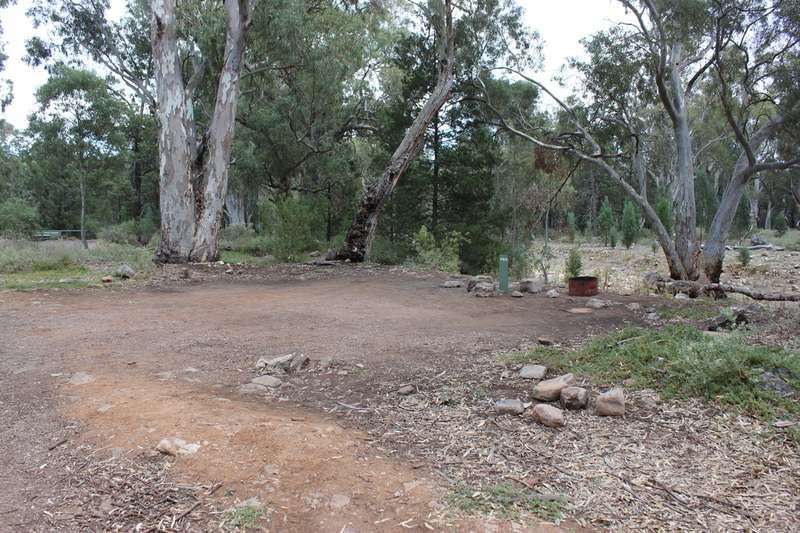 Between some campsites there are communal fire pits or there are fire drums scattered around the place. If you get a site that hasn’t got that fire drum, just find a spare one from somewhere else in the campground. Of course, campfires are prohibited in fire danger season, from November 1st till April. 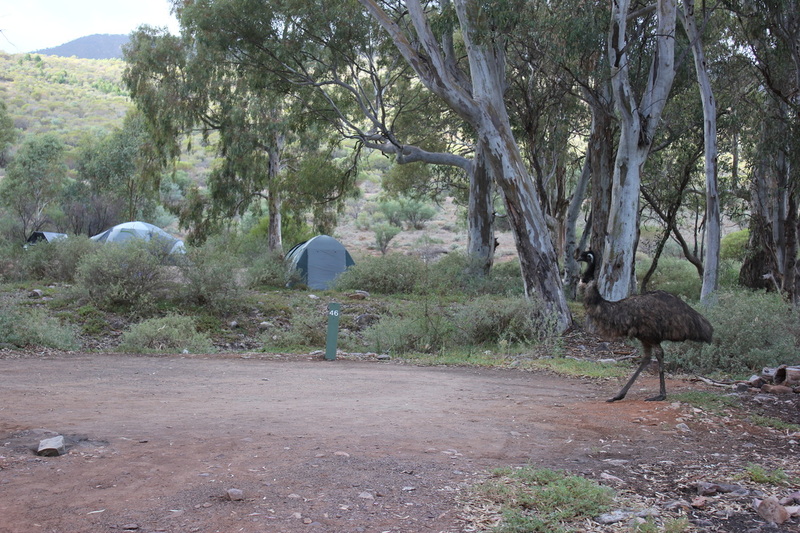 Plenty of wildlife around – kookaburras to wake you at the crack of dawn, emus wandering through your camp and kangaroos bounding around the sites. 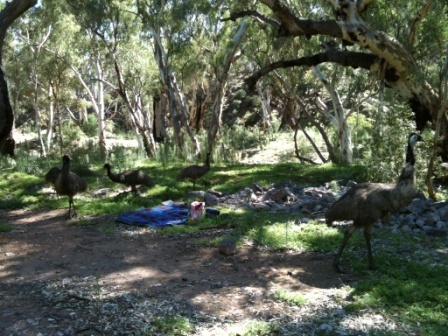 The emus can be a bit too friendly, so watch your food when they are around. Don’t feed any of these animals, as it only encourages them. The creek is great for the kids to look for tadpoles, though we never know when it will be running or not. After heavy rain you expect it to, but we have been disappointed to find that it not always the case. Sometimes though it has been a raging torrent and other times bone dry. 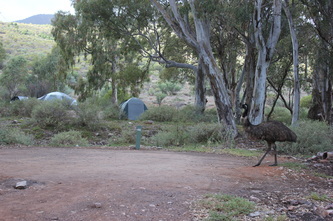 Foxes are around the campsites in the evening, so secure garbage. Some are so used to people, that whilst we were sitting around the campfire one evening at 9pm, the fox was lurking very close to the campsite and to the fire, and did not scare easily. Do not feed them. If you want to see wildlife, then this location is a great place to do so. No koalas have been spotted by us though (might be there, just not as obvious). They are all very good campsites, and most are suitable for caravans and trailers and all are good for tents. Our preference is for ones closest to the creek – and they all vary in size. Some sites can easily fit 2 families. There is at least one site that has 3 campsites all lined up next to one another, with no screening between them (sites 10,11,12) so best to avoid that if camping alone. Lots of large gums, so be wary of falling limbs, though the campsites themselves have been cleared of any overhanging branches of concern. 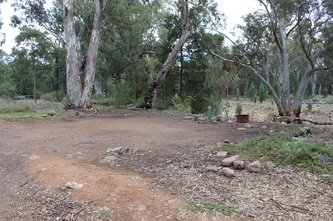 Many of the walks start at the Mambray Creek Day Visitor carpark (which has its own toilet facilities and BBQ). Below are just a sampling of some of the campsites around this area. Next to our campsite one morning - outlook from a campsite near the creek. 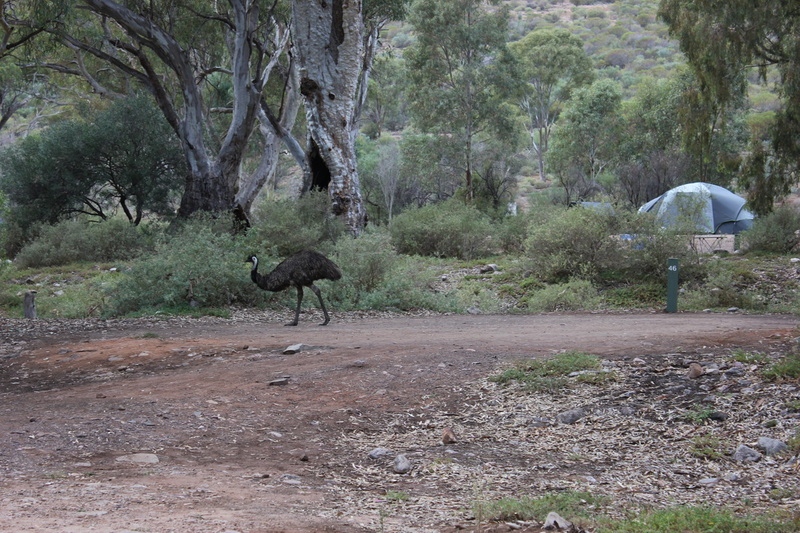 We stayed at the Mambray Creek campground 20/04/2014 and loved it. It was very busy being Easter, but even so, there was still plenty of room for everyone to have their own space. It is easy to access from the main highway, and the self-registration area was well-maintained, clean, tidy, and easy to use. The amenities were clean and tidy. Hot showers were a welcome surprise. Although there are no rubbish bins provided, the park was free from litter. We would love to go back when the creek has water in it, but we still enjoyed the water loop walk. The day visitor area has gas barbecues and there were a large number of families enjoying an Easter Sunday barbecue/picnic. 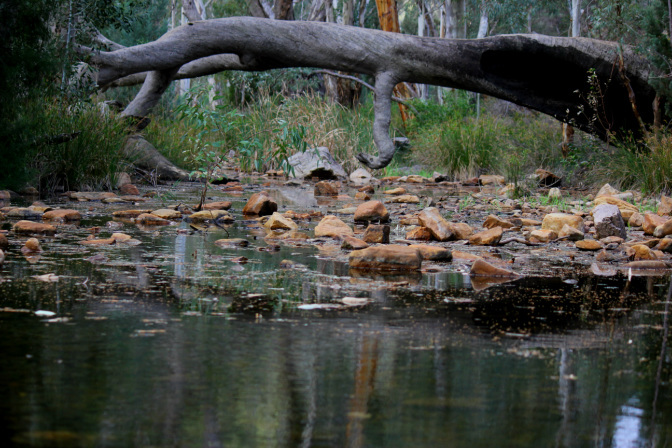 Compared to some other National Parks we have visited, Mambray Creek is definitely high on our list of favourites.